Last week we got the notification that our paper had been accepted to appear in the Journal of Artificial Intelligence. The paper describes a method for building generalisable appliance models from existing data sets, and also a method which tunes such models for previously unseen households using only aggregate smart meter data. This material also appeared in chapters 4 and 5 of my thesis. Oliver Parson, Siddhartha Ghosh, Mark Weal, Alex Rogers. (2014). 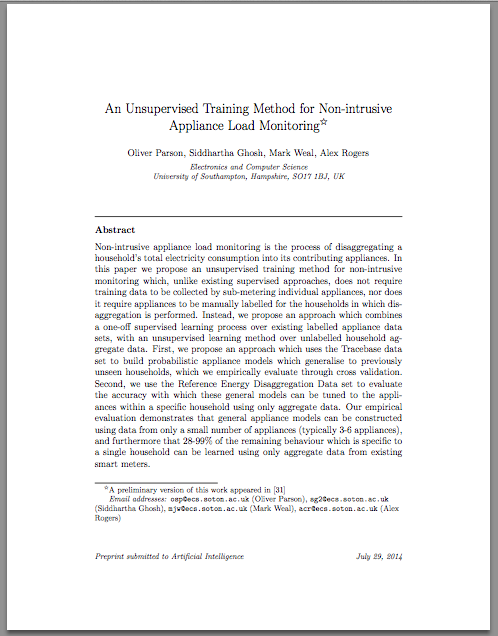 An Unsupervised Training Method for Non-intrusive Appliance Load Monitoring. In: Artificial Intelligence, 217, 1–19. Non-intrusive appliance load monitoring is the process of disaggregating a household's total electricity consumption into its contributing appliances. In this paper we propose an unsupervised training method for non-intrusive monitoring which, unlike existing supervised approaches, does not require training data to be collected by sub-metering individual appliances, nor does it require appliances to be manually labelled for the households in which disaggregation is performed. Instead, we propose an approach which combines a one-off supervised learning process over existing labelled appliance data sets, with an unsupervised learning method over unlabelled household aggregate data. First, we propose an approach which uses the Tracebase data set to build probabilistic appliance models which generalise to previously unseen households, which we empirically evaluate through cross validation. Second, we use the Reference Energy Disaggregation Data set to evaluate the accuracy with which these general models can be tuned to the appliances within a specific household using only aggregate data. Our empirical evaluation demonstrates that general appliance models can be constructed using data from only a small number of appliances (typically 3-6 appliances), and furthermore that 28-99% of the remaining behaviour which is specific to a single household can be learned using only aggregate data from existing smart meters.